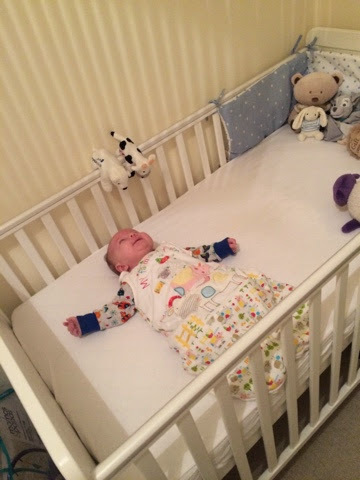 Does anyone else have a baby that seems to rotate whilst they sleep in their cot? 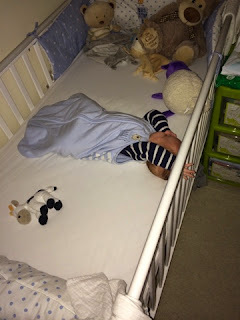 Baby Jake sleeps in his own room in a cot. For several nights now Jake has been extremely fidgety and has been moving tirelessly about the bed in his sleep. To keep him warm we have always used a sleeping bag since he moved into his cot, and it was never a problem until recently. We put him to bed with his feet near the foot of the cot and his head up towards his Ewan the Dream Sheep. But we've been finding him rotating as the night goes on, sometimes a full 180 - 270 degrees!! It baffles us because during the day, when Jake is playing on his mat or on his fleece blanket on the floor, he is nowhere near as roly-poly as this, and he HATES doing tummy time. We have tried using his play mat, a pillow, across our knees and the only way he vaguely does tummy time without crying almost immediately is if we incline and he lies on our chests - it's the best we can do. Yet, in his sleep he's doing circuits around the cot! So tonight, I have taken the sleep bag away and I have tucked him under his cot duvet and a handmade crochet blanket we were given as a gift. I have wedged these tightly down the side of the mattress to see if that will stop his midnight wanderings! Have you had this experience? How did you combat it? Update: so, the tightly tucked blankets DID make a difference because he moved a lot less. However,at 4:30am when hubby got up for work we found he had wriggled out of the covers and was lying under Ewan the Dream Sheep - just as he is in this top picture. So, problem still not solved! Personally I would have nothing in his cot at all. Not even one teddy. We have a cot wrap going around the cot that is breathable. My son used to wiggle around the cot when he was that age too. I think he stopped once he started using a blanket at 12 months. Hi - yep we now have an entirely empty cot bed. I saw some fabulous bumpers on twitter but they were quite expensive and being on maternity I couldn't afford to get them. We've since moved to using a tightly tucked in blanket. Working much better.